Driving in the fog and the dark to Bend, Oregon – actually, Redmond to be precise, just north of Bend – made for an interesting experience. Nothing was clear. We had no idea what was around us. Our world consisted of the fifty feet before us. Driving the same route in reverse on a bright, sunny morning was like being in a different world. We left Redmond and drove for miles through the high desert, brilliant blue above, tans and browns around us. We passed the place that we had assumed in the dark was an alien staging area. Now, in the sunlight, we realized it was a merely concrete manufacturing facility…or so it appeared (those aliens can be pretty sly). Eventually, we began to gain elevation. Trees appeared and soon surrounded us in a heavy forest. And that’s when it happened. 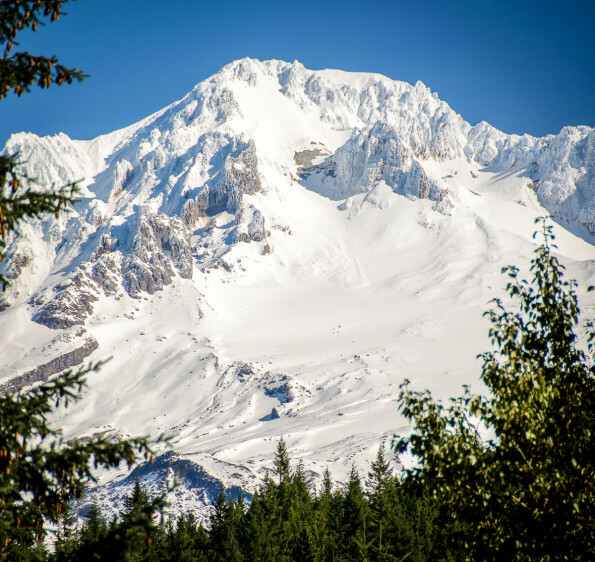 We rounded a turn of Highway 26 and suddenly, all three of us in the car were a united chorus of “Whoa!” For there, before us, was Mount Hood, all 11,250 feet of it entirely filling our windshield. We’d glimpsed it in the distance many miles back and just from glancing at the map, I knew it was somewhere around this area. But we had no idea how close we were to it. We literally were at its base, our entire view filled with snow-covered slopes of this giant right before us. And that’s when two realizations pounded into me. First, it had been here all along. When we drove here in the fog, we had passed by this mountain, a few miles from its peak. Yet we never knew it was there. Second, and even more surprising, I was receiving an object lesson with a very big object lurking nearby. The lesson? That’s how it is with God and me most of the time. He’s always there, bigger and yet nearer than Mount Hood but I never realize it. I go through life, driving in my fog, traveling in the dark not aware that something of even greater magnitude, splendor and beauty is as close as my next breath. Every single moment of life. As dramatic a reminder as this was, I’ll likely fall back into my old ways over time, returning to a place of fog and darkness, consumed only with what I see right before me. That is, until that moment when I can count on God to gently – or, as in this case, dramatically – pull me out of my fog and remind me again of this simple yet profound truth. Read Part 1 if you haven’t already done so.